Throughout the ages of man, philosophers, mystics and visionaries have pondered the meaning of human existence. Why was man placed on this good, green earth? What, if anything, is God doing with His human creation? Does God have any kind of plan, or is man merely some kind of uncontrolled, divine experiment? Life on earth just seems to happen, doesn't it? It's all action and reaction. The fickle finger of fate seems to be constantly stabbing the human race entirely at random. You never know what's going to happen next. There just doesn't seem to be any purpose in it all. The Apparent Futility of Life. It appears that there is no plan, no intelligible scheme of things. Life is a series of accidents and chance circumstances. Everything is cyclical it seems; history does repeat itself. There is predictable pattern but no apparent purpose. Good people suffer too! Evil people thrive and capitalize on the vulnerability of the masses. Oppression is the hallmark of our age; there is no apparent justice. Those who break the rules seem to get away with it with impunity. The wicked flourish like a green bay tree (see Psalm 37:35, KJV). To the average citizen of the world, life just doesn't seem to make a whole lot of sense. It's a series of happenings over which one seems to have little control. Many disillusioned people, faced with the harshness of life on this planet, descend into an attitude of despair and cynicism. "Where is God?" they ask. "I don't see any purpose in all this mess that mankind has gotten himself into. I think the best thing to do is to eat, drink and be merry. Tomorrow we'll all be dead anyway." And so they adopt an attitude of selfishness. Me first. I'm going to get all I can out of this life. I don't want to hurt anyone, but I will if I have to. Life becomes an endless round of pleasure seeking and self-indulgence. It becomes meaningless and fruitless. Too many people adopt an attitude of total pragmatism and opportunism. They give up on life in a sense. After all, what's the use of being moral if people are just going to step on you for it? Why try to fit yourself into some great scheme of things when everyone seems to have a different idea of what the scheme is — or even whether there is one? Reason for Life. Of course, not everyone who has searched for meaning in life has become cynical. Abraham Lincoln, for example, concluded that "The Almighty has his purposes" (address to an Indiana regiment). Winston Churchill, Britain's wartime leader, was convinced that "There is a great purpose being worked out here below." Those who truly wish to find meaning in life can do so. God, the Creator of life, has revealed Himself and His purpose in the pages of the Bible. To those who accept God's written revelation, His plan is no mystery. Speaking of the Church, the apostle Paul wrote: "For he [God] has made known to us in all wisdom and insight the mystery of his will, according to his purpose which he set forth in Christ as a plan for the fullness of time, to unite all things in him, things in heaven and things on earth" (Eph. 1:9-10). God has a purpose — a plan! That plan is being worked out by Jesus Christ. It will come to fruition in "the fullness of time" and it will involve the uniting of all of the elements of the universe in Christ! What God is telling us is that someday it will all come together — it will all make sense! What seems to be a random, uncontrolled divine experiment will ultimately jell into a beautiful, cohesive unity that will dazzle the senses and stagger the mind! Jesus Christ, as "Executive Director" of the divine plan, is very much on the job. He said: "I work and my father works" (John 5:17). Christ is working out the great master plan of salvation which involves the reconciliation of all of mankind to God. Ultimately, Jesus will bring about the "restitution of all things" (Acts 3:21, KJV). Jesus' Message. Jesus Christ came with a message from God the Father. 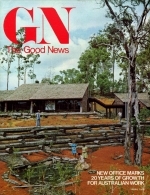 It was one of good news — the "gospel of your salvation" (Eph. 1:13). That message contained hope for the future of the human race. It was a message of how man could be reconciled to God and how he could actually become a part of His divine Kingdom. Therefore it was called "the gospel of the kingdom" (Matt. 24:14). In the first instance of Jesus' preaching, we find this account: "Now after John was arrested, Jesus came into Galilee, preaching the gospel of God, and saying, 'The time is fulfilled, and the kingdom of God is at hand; repent, and believe in the gospel'" (Mark 1:14). Jesus came to reveal the way into the Kingdom of God! Prior to Jesus' time the people had only had "the law and the prophets" (Luke 16:16), but now "grace and truth" were added (John 1:17). Jesus brought the light of the gospel into the world. He came with new information that had not previously been revealed. Until God sent Jesus Christ with the message of the gospel, the plan of God had been somewhat enigmatic to the religious world. A blanket of "darkness" had been spread over the Jewish people concerning the real meaning of the Scriptures. Paul pointed out that "God gave them a spirit of stupor, eyes that should not see and ears that should not hear, down to this very day" (Rom. 11:8). No one had really understood, with full comprehension, the marvelous plan of God up until that time. Even Paul confessed that "we know in part" (I Cor. 13:.9, KJV). The average man on the street would consider most of this foolishness, of course. "Nobody really knows what God is doing," he would explain. "The unspiritual man does not receive the gifts of the Spirit of God, for they are folly to him, and he is not able to understand them because they are spiritually discerned" (I Cor. 2:14). So long as the world refuses to "repent and believe the gospel," it cannot know what God is doing! The world has shut itself off from that information by its refusal to submit to God. A Way Out. But you can know! You can understand. Jesus said: "Come to me, all who labor and are heavy-laden, and I will give you rest. Take my yoke upon you, and learn from me..." (Matt. 11:28-29). Jesus Christ, the Captain of our Salvation, will teach and instruct you through His Word and through the Holy Spirit: But you will first have to allow Him to enter into your life — and become a vital part of it! The only real hope of eternal glory is "Christ in us" as Paul pointed out in Colossians 1:27. Jesus Christ is the "door" through which •we enter into eternal life. He is the only way to the Kingdom of God. He said: "I am the way, and the truth, and the life" (John 14:6). There is no other name under heaven by which we can be saved (Acts 4:12). There is no way anyone can reject Christ and still expect to understand the plan of God. Christ is the key figure in that plan. He is working it out. He alone has made it possible for man to be reconciled to his Creator: "For in him all the fullness of God was pleased to dwell, and through him to reconcile to himself all things, whether on earth or in heaven, making peace by the blood of his cross" (Col. 1:19-20). It is through Christ's sacrifice on the cross that God set up the mechanism by which man could be reconciled to God. That aspect of the plan is complete. Jesus was born of a virgin, lived, preached, was crucified, died, was buried and was resurrected after three days and three nights. He now sits at the right hand of God the Father as High Priest and Mediator for the children of God (the Church). The act that made it possible for man to be reunited with God is complete. In that sense, man has been reconciled: "And you, who once were estranged and hostile in mind, doing evil deeds; he has now reconciled in his body of flesh by his death..." (Col. 1:21-22). Paul was addressing the Church. Those who are true Christians and have accepted the lordship of Christ, and who have faith in His sacrifice, have been reconciled to God. We are forgiven, washed in the blood of the "Lamb." We are no longer cut off from God by our sins (Isa. 59:2). We Don't Have It Made. But we don't have it "in the bag"! We can still lose that condition of reconciliation. God has attached a string, a provision, on that status: "... Provided that you continue in the faith, stable and steadfast, not shifting from the hope of the gospel..." (Col. 1:23). This is very important! Christians must realize that it is entirely possible to lose out on salvation even after they have been reconciled to God by the blood of Christ! Paul himself did not believe that he had it made, though he was reconciled. He wrote: "I count not myself to have apprehended..." (Phil. 3:13, KJV). He knew he could lose out on the Kingdom if he forsook his hope in the gospel. "For if we sin deliberately after receiving the knowledge of the truth, there no longer remains a sacrifice for sins, but a fearful prospect of judgment, and a fury of fire which will consume the adversaries" (Heb. 10:26-27). This refers to reverting to "sin" as a way of life. It speaks of returning to the world out of which one was called — of forsaking the Christian way of life. Peter likened it to a dog returning to its own vomit (II Peter 2:22). The point is: it is possible to be "lost" after one has been reconciled to God through Christ! Every Christian should strive to make his "calling and election sure" (II Peter 1:10, KJV). Intended From the Beginning. As we have clearly seen, God does have a purpose — a master plan for the universe. It is being worked out through the agency of Jesus Christ. And that purpose is one of long standing. It was established even before the creation of the first man. God knew just how He would reconcile man to Himself in Christ even before the world was created! Speaking of those who would Ultimately be in the Kingdom, Jesus said: "Come, O blessed of my Father, inherit the kingdom prepared for you from the foundation of the world" (Matt. 25:34). God had intended, right from the very beginnings of the material universe, to provide a Kingdom for the saints to inherit. Preparations were made long beyond the memory of man. But certain aspects of that great master plan had been hidden from man's understanding. God did not reveal the entirety of His plan to the early patriarchs of the Old Testament. Many of the prophets earnestly desired to look into the things which we can now understand and know (Matt. 13:17). But Jesus uttered "what has been hidden since the foundation of the world" (Matt. 13:35). God does have a purpose — a master plan for the universe. It is being worked out through the agency of Jesus Christ. And that purpose is one of long standing. It was established even before the creation of the first man. come to this earth and be revealed to man. Peter wrote: "He was destined before the foundation of the world but was made manifest at the end of the times for your sake" (I Peter 1:20). God knew that He was going to select a people, an ekklesia (church or group), to exemplify His way upon the earth. And He knew that long before He created man through Christ: "Even as he chose us in him before the foundation of the world, that we should be holy and blameless before him" (Eph. 1:4). God knew that Christ would have to die in order to pay the penalty for human sin. The Lamb was "slain from the foundation of the world" (Rev. 13:8, KJV). Every human being, from Adam to the last human being ever born, will have his or her opportunity to become a part of God's great plan of salvation! God is not willing that any should perish, but that "all should reach repentance" (II Peter 3:9). The Three Resurrections. Each of us will be included in one of a series of three possible resurrections. There is a resurrection to eternal life; there is one to judgment; and finally, one to eternal death. Jesus said: "Do not marvel at this; for the hour is coming when all who are in the tombs will hear his voice and come forth, those who have done good, to the resurrection of life, and those who have done evil, to the resurrection of judgment" (John 5:28, 29). Those who take _part in the first resurrection will live and rule with Christ in the Kingdom, administering God's government on this earth for a thousand years (see Rev. 20:4, 6). Others who have never had an opportunity to be called to the Kingdom will be resurrected back to physical life and given an opportunity to live God's way. This second resurrection will occur after the thousand-year rule of the saints: "The rest of the dead did not come to life again until the thousand years were ended" (verse 5). The Exciting Climax. After the third resurrection, which follows the millennium, God the Father will descend to a refurbished earth which has been prepared for Him by Christ and the saints. John wrote of this in Revelation 21: "Then I saw a new heaven and a new earth.... I saw the holy city, new Jerusalem, coming down out of heaven from God... and I heard a great voice from the throne saying, 'Behold, the dwelling of God is with men. He will dwell with them... and God himself will be with them..." (verses 1-3). Here we are reading, about the culmination of the master plan of God! Here is the exciting climax to that great, divine purpose! God dwelling with men! The complete absence of evil in the earth and its environs. In the new Jerusalem, "There shall no more be anything accursed, but the throne of God and of the Lamb shall be in it, and his servants shall worship him; they shall see his face, and his name shall be on their foreheads" (Rev. 22:3-4). At this point in future history, every human being who has ever lived on earth will have had his or her chance for salvation. The vast majority of mankind will have "made it." Some — the incorrigible wicked — will have ceased to exist. They will have been burned up completely in the lake of fire (see Malachi 4:1). No trace, no spirit, no soul, no flesh — nothing of them will remain, It will be as though they had not been. Satan, too, will have been banished to "outer darkness." Never again, from that time on, will he or his demons be allowed to influence the children of God. They will be like "wandering stars for whom the nether gloom of darkness has been reserved forever" (Jude 13). Evil will have been banished from the universe and peace will reign supreme. Death will be a thing of the past. Mankind will have realized his ultimate destiny within the family of God. Man will have been made immortal. The apostle Paul summed up the sequence of events in the master plan of God in his letter to the Corinthians: "As in Adam all men die, so in Christ all will be brought to life; but each in his own proper place [order]: Christ the firstfruits, and afterwards, at his coming, those who belong to Christ. Then comes the end, when he delivers up the kingdom to God the Father, after abolishing every kind of dominion, authority, and power. For he is destined to reign until God has put all enemies under his feet; and the last enemy to be abolished is death. Scripture says, 'He has put all things in subjection under his feet.' But in saying 'all things,' it clearly means to exclude God who subordinates them; and when all things are thus subject to him, then the Son himself will also be made subordinate to God who made all things subject to him, and thus God will be all in all" (I Cor. 15:23-28, The New English Bible). The Master Plan Complete. What a marvelous statement: "God will be all in all"! The entire universe will be united to God — reconciled in Christ! Man's destiny will be complete. The master plan of salvation will have been worked out by Christ. The Spirit of God will permeate the universe. How could anyone, realizing these dazzling, inspiring truths, wish to remain apart from that magnificent plan? Can you possibly remain uninvolved? "Beloved, we are God's children now; it does not yet appear what we shall be, but we know that when he appears we shall be like him, for we shall see him as he is. And every one who thus hopes in him purifies himself as he is pure" (I John 3:2-3). Will you take the first step to such self-purification? And if you have done so, will you continue in the faith? Will you do what is necessary to fulfill your intended role in God's great master plan of salvation? Further information about God's master plan for mankind is available in the booklets listed below.